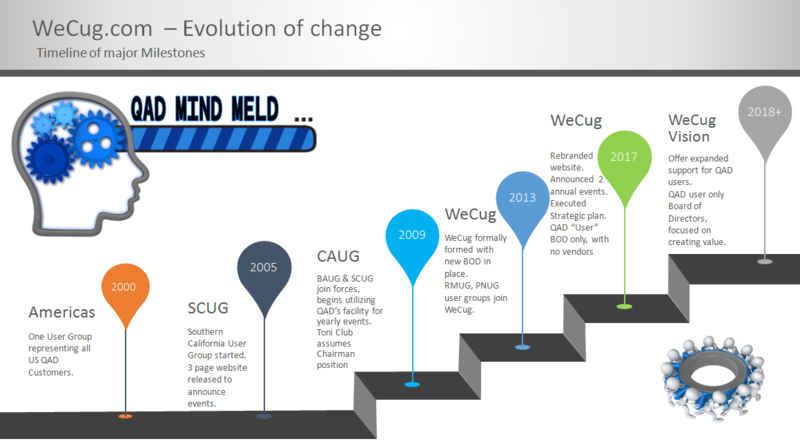 By utilizing the High Performance Management System (HPMS) the QAD WeCug Board of Directors has transformed the QAD West Coast User Group (WeCug) into a high performing, active entity whose sole purpose is to foster the highest level of utilization of QAD at its member companies to better serve users throughout the Western U.S…… and beyond. Please take time to review our newly crafted Mission and Vision Statements, we feel strongly you’ll be extremely pleased with our new offering and will greatly benefit by joining our user community. As a special gift for completing the membership inquiry form, we have developed a 24-page QAD Quick Reference Guide that you can utilize to help optimize your QAD ERP experience. This valuable gift enables users to receive quick answers to the questions they so often encounter, as well as allowing new users the quick exposure they need to fully utilize QAD’s product. The WeCug Board of Directors would like to thank Toni Clubb our Past WeCug President for her unwavering past leadership for the past 8 years. She has enabled the continued perpetuation of the QAD User Community through her passion for the product and customers, a true selfless collaborator! Copyright © QAD West Coast User Group.